Airtel's New Infinity Plans are Biggest Fail of The Decade. Read Why? Hello guys, first of all, let's say thanks to Reliance Jio for making this Telecom Industry highly competitive. Before Jio, everybody was fed up of paying extra money for data packs, but now, everyone is getting cool offers from all Operators. Even broadband companies has doubled their data packs on same cost. Recently, Airtel has launched two new Infinity plans. These two plans are highly competitive to Reliance Jio plans only for Airtel Employees. This is because, they never tell us hidden terms and conditions while advertising new plans. So guys, here I am giving you a short comparison of Airtel's and Reliance Jio's postpaid plans. Airtel has launched its Rs. 549 and Rs.799 offer in a bid to counter the growing popularity of Jio's Happy New Year Offer. But these two plans are like a rock in front of the Himalayas. For the first time this plan looks attractive but when you go in detail, It became one more big fail. In Infinity plan Rs. 549, you will get 1Gb Internet and 3GB if you have a 4G handset for one month. While Reliance Jio is giving everything in its 299 Rs plan with unlimited data at night along with additional 4GB hotspot data. If you compare Reliance Jio 499 rs plan, still Rs 549 plan is a big fail for Airtel customers. Because in a Rs 499 plan, Jio is giving you 4+8Gb of data with unlimited data during the night. It shows, A cheapest Airtel's plan is many times costlier as compared to Reliance Jio. If you don't have 4G handset then you will only get 1Gb data for 1 month which is quite low. For a normal user like me, 1 GB is like 10 15 YouTube videos. So, as per data pack requirement, buying this plan is like donating your money to Airtel. If you compare both Reliance Jio and Airtel's Infinity packs, you will see that in Infinity pack roaming is not free. If you remember that our country is trying hard to make roaming free, but operators like Airtel and Idea doesn't want to give us anything for free. Instead for free roaming you have to pay money for their packs. Why? It's just Hunger for money. While in Reliance Jio, every call is free, even roaming is totally free. So, again Aitel proved that they just want to waste their money on misleading promotions. This makes customer very angry when they read complete details of Airtel's Plans which are nothing but old plans with new names. As you guys are aware of reliance Jio Happy new year is much better than any plan on this earth, Money hungry operators like Airtel can never compete with incumbents like Jio. 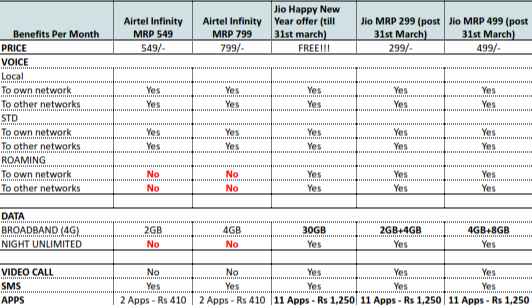 Check out below image for a quick comparison of both Airtel and Jio Plans. It's proved again that Airtel's offers are just to seek media attention and are big fail of this decade. Lets support who thinks about us.